Updated: 10/27/2015. The Control Road has been paved an additional 1.6 miles since I rode this in 2014. I’ve updated the various distances but not the map or profile. This is a 107 mile loop that climbs Mt Lemmon from the north-east, riding first up Oracle Road and through the town of Oracle. It has 23 miles of dirt roads and 84 miles of paved roads. Markers B and C on the map show where the ride switches between pavement and dirt. Marker B, a few miles after Oracle, is the start of the dirt. 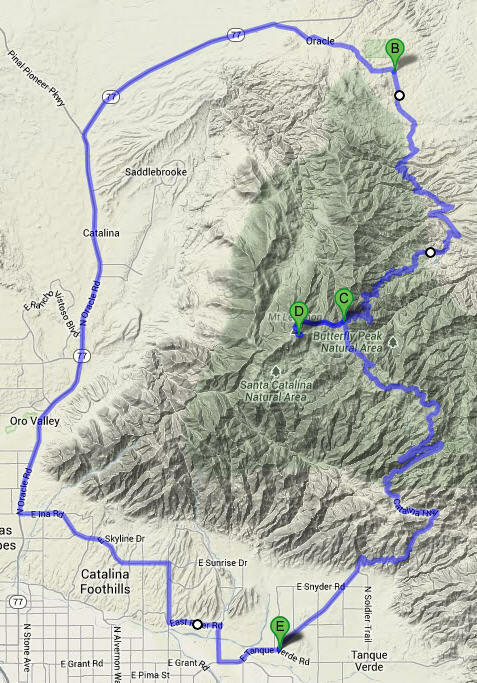 Marker C is where you reach the paved Mount Lemmon Road. Marker D is the parking lot at the top of Mount Lemmon. Markers B, C and D are represented by the vertical red lines in the elevation profile. You ride from Le Buzz to Oracle Road, then do a long gradual climb up to Oracle. From the start of the dirt road you traverse southwards along the flank of Mt Lemmon along a surprisingly rolling road before starting the relentless climb to Summerhaven then the top of Mount Lemmon. Park at the NE corner of Tanque Verde and Catalina Highway (the LeBuzz/Safeway parking lot). Ride west to Sabino Canyon Road. Turn right and follow this to River Road. Turn left and continue to Craycroft. Turn right on Craycroft and climb to Sunshine. Turn left and follow Sunshine/Skyline/Ina to Oracle Road. Turn right on Oracle Road (Highway 77) and do the long, false flat climb to Oracle. Turn right at the sign for Oracle – you can get more liquids and foods at the Circle K just after this turnoff. Ride through Oracle for 2.4 miles to where the signed Mt Lemmon road turns right (opposite Oracle Market). 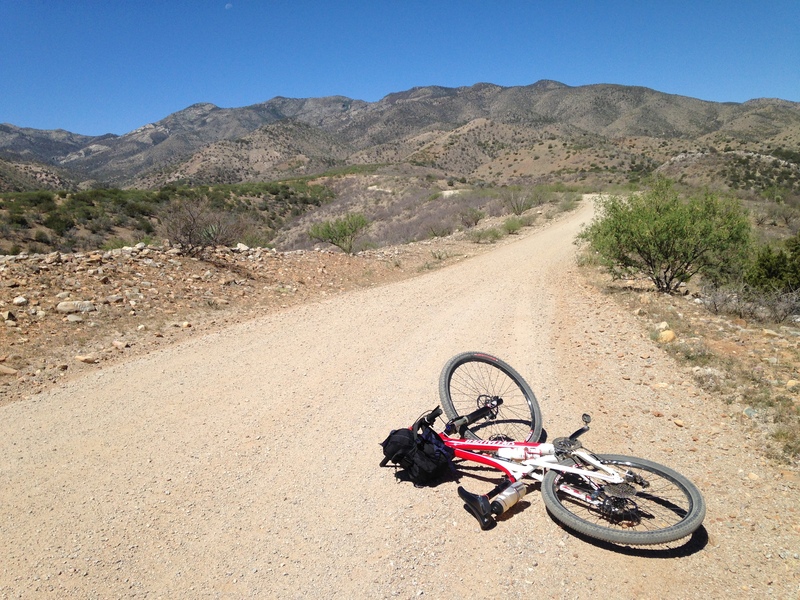 Follow the paved road for 4.8 miles to where the main road turns to dirt at the intersection with Campo Bonito Road. The Control Road (FR 38) continues along the dirt. Follow the good dirt road as it heads south along the flank of Mt Lemmon. After Peppersauce Campground the road narrows and becomes a bit rougher. There is a surprising amount of downhill on this section. Eventually, after the second really long downhill, the road heads up towards Mt Lemmon and after many more miles of climbing, switchbacks, and amazing views, the road enters the trees and the views end. Many more switchbacks later, you’ll reach the paved road just above Summerhaven. Turn right and head down towards Summerhaven, then turn right again and climb up Ski Run Road for just over 3 miles to the parking lot by the Sky Center gate, which is usually closed and locked. Turn round and ride 32.2 miles back down the paved Mt Lemmon road to where you left the car. 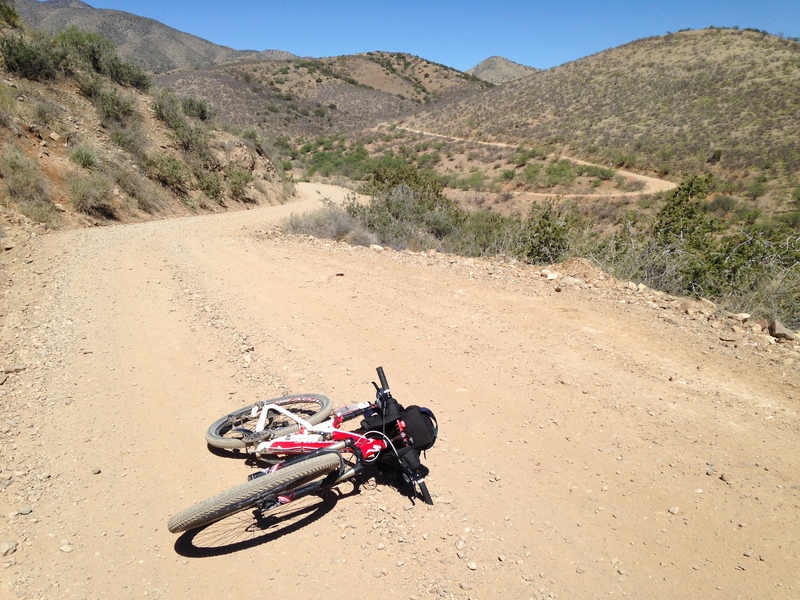 This ride has relatively little dirt road compared to paved road. A much better way up the back of Mt Lemmon is to ride over Redington Road and up Black Hills Mine Road.